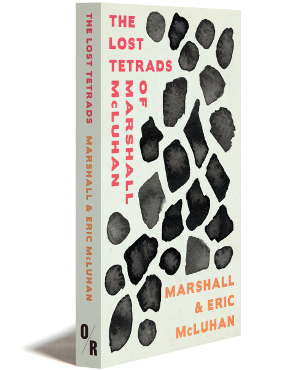 Marshall McLuhan, media theorist and author, "The Lost Tetrads"
Marshall McLuhan (1911-1980) was an internationally-renowned media theorist and perhaps the first genuinely “modern” philosopher of communications. In the 1950s, he introduced the concept of the “global village,” a vast global “technological mind” that today would be called the Internet. Using humor and scholarship, he spoke of the interconnectedness of visual and written media—and nowhere do his theories achieve a more finished level than in the tetrads, as important visually as they are syntactically.